Have you been listening to – or perhaps participating in – the Talk With The Experts series of live workshops hosted by the SitePoint Forums? They’re a great way of getting under the skin of new and emerging technologies. It’s easy to put a question or two into the mix and get real, live answers, or just lurk and soak up the knowledge. The next in our series of expert chat sessions is timed to coincide with the launch of our book on the same subject, and that subject is Sinatra. 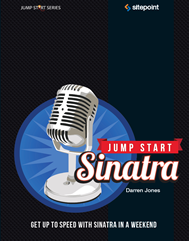 Our experts are Darren Jones (author of the forthcoming Jump Start Sinatra) and Konstantin Haase (expert reviewer). Join us on Wednesday, 23 January at 8:00 p.m. GMT. The forum page has some helpful tips including how to find out what time the chat will be at your place, email reminders of the sessions for which you can sign up and the direct link to the chatroom, which will be posted live 15 mins prior to kick-off. There are also links to transcripts of previous sessions. And it’s all free. Ricky Onsman is a freelance web designer, developer, editor and writer. With a background in information and content services, he built his first website in 1994 for a disability information service and has been messing about on the Web ever since.